Florida's unique climatic characteristics allow for forage production most of the year with a large variety of possible forage choices. Independent of the size of the operation and number of horses, good forage planning can help reduce feeding costs, environmental impacts, and nutritional disorders caused by high-concentrate feeding. 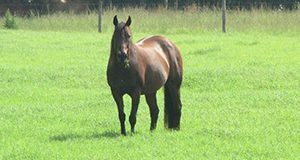 With the exception of high-performance animals, horses can meet most of their nutritional needs from pasture. However, achieving this requires careful planning and implementation of a forage production and utilization program. This 9-page document discusses intake and nutrient requirements, pasture planning, forage species, and pasture management. Written by M. Wallau, E. L. Johnson, J. Vendramini, C. Wickens, and C. Bainum, and published by the UF/IFAS Agronomy Department, revised January 2019.